or work on my own. This site has helped me but truth be known when I have a day where I’m editing working in hours not words how can I keep up with this site’s requirement. 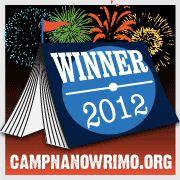 Then again NaNoWriMo arrives in November and I have had a glimmer of an idea for a story to write then. The fun of NaNo is when I’m working on something new and I let the story run wild. But of course eventually I have to see if it is a viable idea. This BLOG doesn’t count for my 100 x 100 word count either. It might count on the site but not for writing purposes. That means either get busy with Stolen Secrets or write some more words on the Camp NaNoWriMo nicknamed Collin and Lisa for the two main characters. Still working here and debating. The time is 8:45 p.m. Central Daylight Time. Going to post this and see who wins the toss of words.